Should you lose 19 stone in just two years, there’s naturally going to be a bit of excess skin left over at the end. And one 44-year-old grandmother-of-four from Swadlincote, Derbyshire, was left with three whole feet of it, after shrinking from 31 stone to just 12. But Amanda Smith, a full-time carer who has six children, has now undergone pioneering surgery to remove the 10lbs of saggy skin so she can wear a Christmas party dress for the first time – and is now confident enough to undress in front of her partner Barry, who had never before seen her naked. Ms Smith tipped the scales at 31-stone by feasting on takeaways, chips and cream cakes after the birth of her son 11 years ago. She paid £7,000 for a gastric band in 2009 and shed an incredible 19 stone in two years, but was left with large flaps of skin – which weighed 10lbs – all over her body. She underwent a nine-hour operation to have the skin removed on the NHS in January, and now weighs 12 stone. She has also dropped 11 dress sizes to a size 12. Amanda has now revealed how the surgery has made her so confident she is able to wear a figure-hugging party dress – as well as a bikini – for the first time in her life. She said: ‘It’s alright feeling great after you’ve lost weight but I could see the skin when I took my clothes off. Amanda admitted she has never owned a swimming costume or a bikini in her life, and that even when she was a child she would ask her mother to write notes as excuses so she didn’t have to do swimming at school. She added: ‘And I would always keep a towel around my body in the changing rooms for PE. But this summer just gone I went to Crete with my partner and it was the first time I had worn a bikini ever. ‘It felt so nice but I was still a bit self-conscious because I have a few scars from the operation. The dress was a gift from her partner, Brian Minchin, who bought it for her to celebrate her dramatic weight-loss. She said: ‘It is black and lacy with cream underneath, and I have still got it now. I remember thinking "that will never fit me", but it did. I’m going to wear it for Christmas parties as well. I love it. ‘It is still unreal to me. I still go into shops and think that there’s no way something will fit me. Amanda, who has six children and four grandchildren, lives with her engineer partner Brian Minchin, 42. She added: ‘I’ve always been very overweight from when I was a toddler all the way through to adult life. And every time I had a child it got even worse. ‘One day I sat and thought I want to see my grand kids grow up. I didn’t have a medical condition but I was out of breath just walking up the stairs. 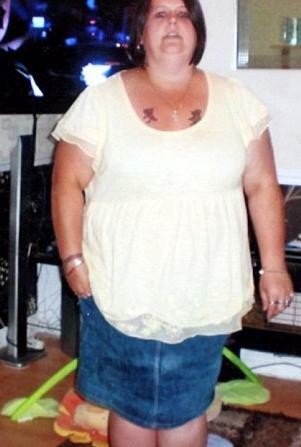 Initially, Amanda dieted on her own and lost six stone – but she then struggled to lose any more for six months. But since recovering from the operation she says she is a ‘changed woman’, and can finally undress for her partner – who had never seen her naked before. She added: ‘My partner Brian had never seen me without any clothes at all. I’d never strip off in front of him because of my body.